Jess Forster Blog about sustainable textiles, felt, art, design. Art from the earth featured at new fibre art exhibition. Emerging textile artist Jess Forster uses natural materials from her Riverina home’s environment to create the evocativeKindred of the Dust exhibition, opening at Newcastle’s Timeless Textiles in June. 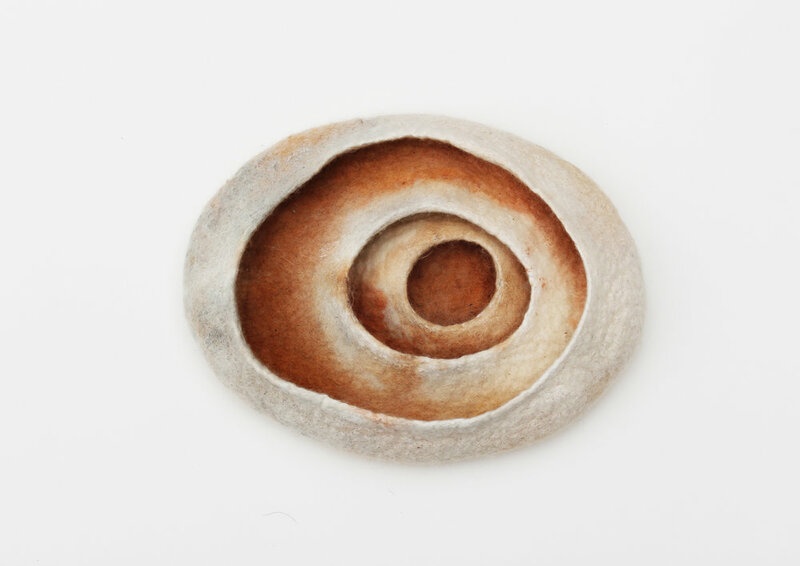 Forster’s sculptured felt artworks feature locally collected fibres, native seeds and earth pigments. Her work is an experimental inquiry into the emotionally constructed relationship between humans and the natural environments that surround us. The Kindred of the Dust collection questions our connections to place. The works are embedded and dyed into powerful topographic landscapes, hollowed felt totems, and three-dimensional limbs. Some pieces have been left outside at various locations that are meaningful to Forster. This has allowed natural weathering, colouring and the germination of seeds. The forms have become a conceptual mapping-tool. They are physical representations of Forster’s land and location. They also seek to capture her emotional connection to place and ‘home’. Forster’s works are observations of the cyclical, miniscule natural processes in our world. She observes a tiny seedling poking through the earth, ant highways, dripping sap, opening seed-pods, bark of ancient gums and the organic patterns of silt drying on the edges of billabongs. “I like to imagine these tiny happenings out of their context, under a microscope, from the air, or as if I was nestled inside,” Forster said. Forster graduated from a Bachelor Design/Art Education from UNSW in 2015. She worked as a Textile and Visual Arts teacher before working in the Netherlands in 2016 for textile artist Claudy Jongstra. She received a Create NSW Young Regional Artist Scholarship to help develop her practice and has been a part of numerous exhibitions. These include ‘Push the Medium’ at the Narrandera Arts Centre, and three solo exhibitions in Wagga Wagga, Tumbarumba and Orange. The exhibition runs from 13 June to 8 July with the opening on 14 June.